We’ve put together a truly special up-market ‘micro adventure’ package that gives you the sense of freedom and escape of a bikepacking trip but takes away all the hassle and discomfort. Bespoke self-guided route for discovering the beautiful Peak District National Park in your own way. Unique & exclusive bunkhouse & luxury bell tent woodland camp accommodation over two nights. Luxury, local produce, Firepot dinner and breakfast hamper included. Arrive at our Hope Valley base in the afternoon/evening where we’ll kit you out with all the gear you need for your adventure; bike, luggage and equipment. All you need to bring with you is a sleeping bag, some suitable clothes and a sense of adventure! We’ll introduce you to your first night’s accomodation in our specially made, simple yet comfortable Adventure Bunkhouse. A stone’s throw from the beautiful villages of Castleton and Hope, it’s ideally located to explore local pubs and restaurants. In the morning we’ll brief you on your bespoke route of discovery through the Peak District National Park, pointing out interesting local gems and our top recommendations for re-fulling along the way. Along with a route map, we’ll get you set up with one of our easy-to-use bike GPS units, meaning you’ll always be aware of your next turn. Enjoy the ride through the back lanes, ancient tracks and flowing trails of the ‘White’ and ‘Dark’ Peak. We’ll tailor the route to your group’s needs and abilities, taking into account local conditions and winding you past all of our favorite spots. It’s up to you how fast you travel and how long you stop. This is your own journey of discovery. 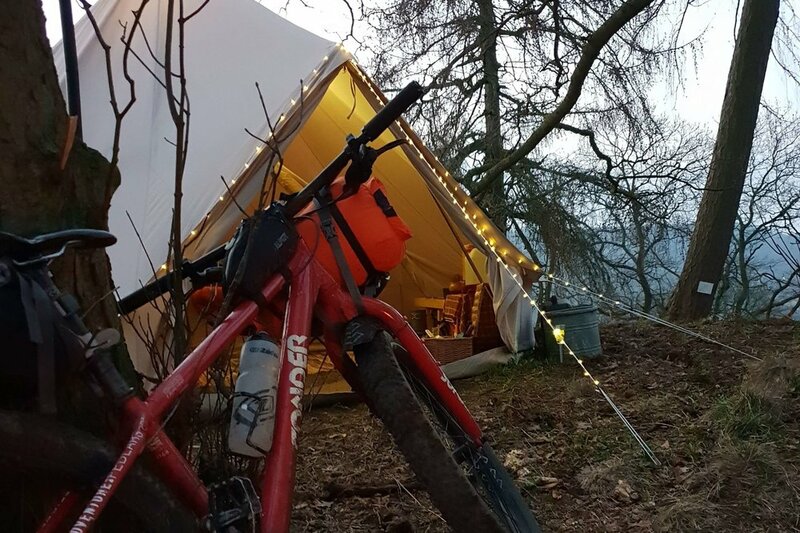 At the end of your day’s ride we’ll be there to welcome you to our secret, ‘wild’ Glamping spot nestled in a stunning woodland location. 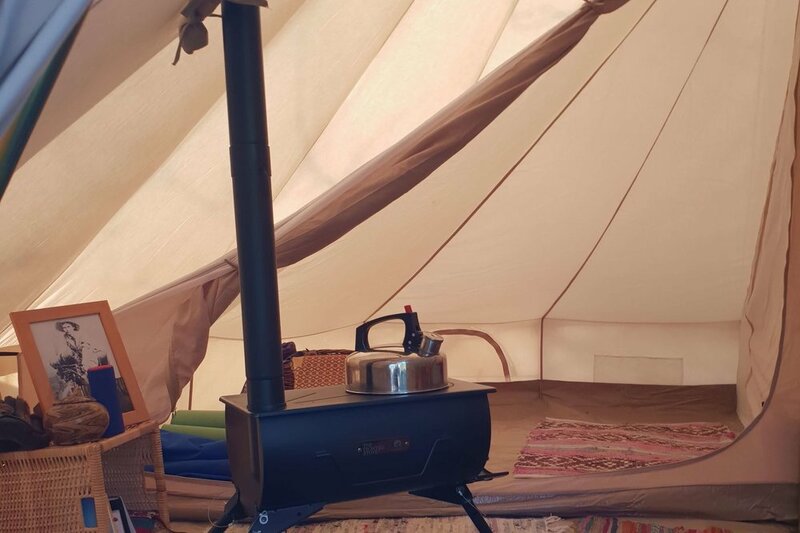 You’ll discover a fully set up, private luxury camp with one of our cosy five meter Bell Tent UK Bell Tents, complete with kitchen, wood burning stove (for chillier nights) & comfy beds. Outside, the camp comes pre-setup with fire-pit seating area, dry wood store, shower tent and a spectacular ‘loo with a view’! We’ll also provide you with a luxury, local produce hamper containing your nights dinner and morning’s breakfast (along with a few extra-special camping treats…). 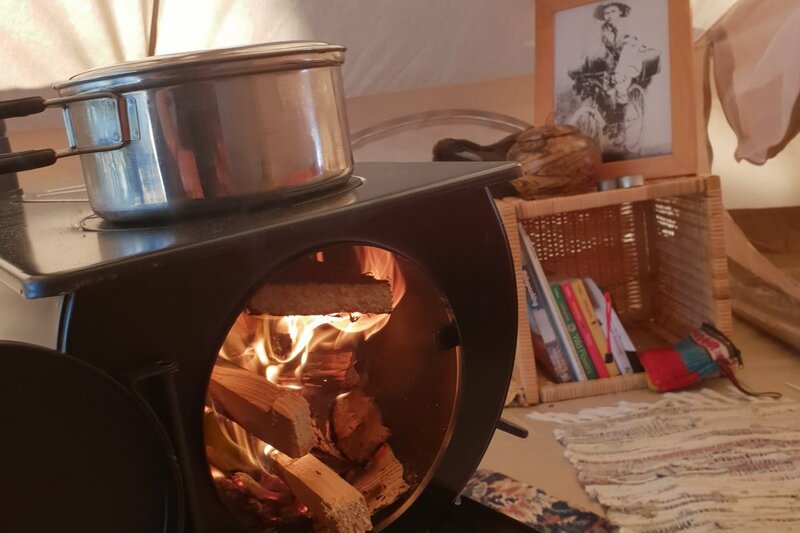 Enjoy your evening relaxing and glamping in style away from all the hussle bussle of normal life, mesmerised by the sparks rising from the campfire into the night sky. After waking up in the glorious peace of the woods, set off in your own time and continue your journey back towards us the Hope Valley. You’ll now feel truly in the ‘rhythm’ of bike travel with the impression that you’ve perhaps been on the road for days. Watch the stunning Peak District landscapes change as they drift by and discover even more local treasures along the way. As you approach the Hope Valley you have the option of completing the last part of your journey by train as our Hope Valley line stops at several villages en-route (…for those who’d rather spend more time in the café’s and pubs!). Return back to us in the late afternoon and share all of the tales of your adventures over a well earned brew. 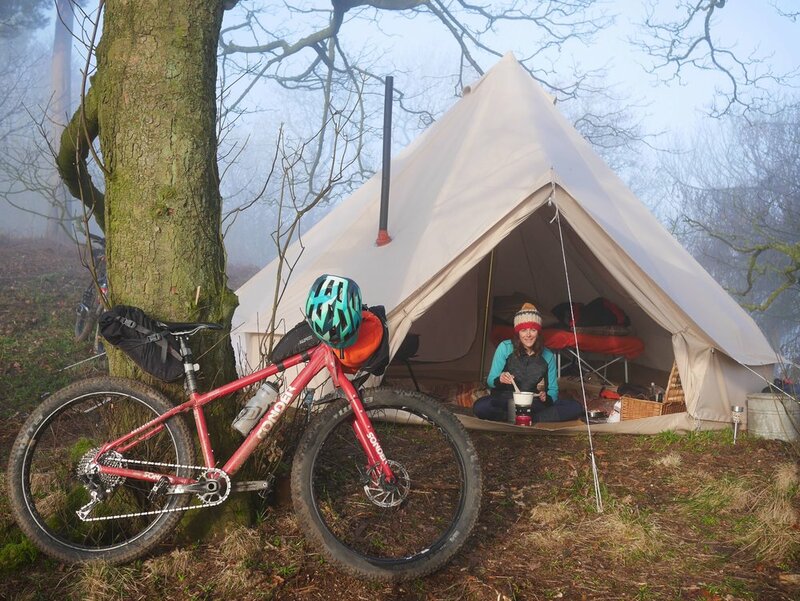 Bike, luggage, equipment and GPS hire for the duration of the Bikeglamping escape. Two nights accomodation in our Bunkhouse & luxury bell tent woodland camp. Train station bike pickup/drop-off option. Thorough route and kit briefing session from our professional and experienced instructor team. 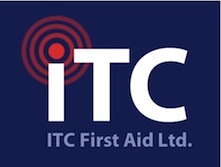 Bespoke self-guided route and emergency support. Personal welcome and briefing at our woodland camp. Your choice of tasty Firepot evening meals & local produce breakfasts on both nights and special ‘treats hamper’ at the woodland camp site. Lunches and extra food and drinks - Bring along whatever snacks you fancy for riding over the weekend. You'll have the chance to pick up food from our recommended favorite local produce shops, pubs and cafe stops along the way… That’s part of the fun. There’s also a whole host of pubs and restaurants to explore within walking distance of the bunkhouse on the first night if you’d prefer to dine out. *bespoke dates and single night trips are available. Contact us with any enquiries. Can’t find what you’re looking for? If you’re after something truly unique then we can put together fully guided bikepacking expedition for you. You can hire a highly experienced private guide for an additional £120 per day. They'll organise and tailor the expedition to suit your aims and aspirations perfectly. You can either enjoy one to one coaching or, if you get together as a group (up to 8), you can split that guide cost between you. Get in Touch and we’ll price up your own unique trip in the UK or further afield.